When the new technology comes, the older one becomes obsolete. Same is the case with pedometer apps for Android. Earlier, you had to spend few bucks for buying a pedometer to count and monitor your steps every day. A pedometer is a device used for estimating the distance traveled on foot by recording the number of steps taken. A pedometer device works fine for traditional people who enjoy taking an additional device with them. But banking on the newer technology, modern generation likes to find a replacement of pedometer with various best pedometer apps for Android. Thankfully, many free pedometer apps for Android are capable of replacing traditional pedometer devices. 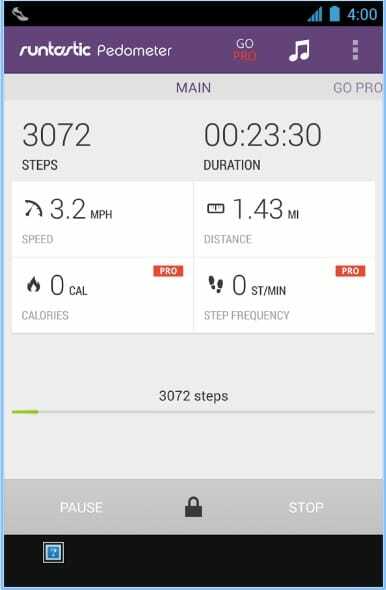 A pedometer app for Android uses your Android phone’s geo-sensor to count the steps taken and then converts the data to measure the distance traveled. The best pedometer apps not only count the steps taken and distance traveled but also monitor and motivate you to achieve your daily walking goals. With the ability to track your daily movement and re-enthusiast you for physical activities, pedometer apps for Android are your perfect companion to improve your fitness more practically. Your smartphone packed with the latest technology has enough functionality that you don’t need a separate pedometer device. All you have to do is find one of the best pedometer apps for Android and install it on your Android phone. Never worry about forgetting to take the pedometer with you when you have already installed pedometer app on Android. There are thousands of “so-called” best pedometer apps for Android available in the Google Play Store. But definitely, not all of them are worth exploring. If you are wondering what is good pedometer app for Android that you can install, we have hand-picked top 7 best Android pedometer apps for you. Walk with Map My Walk also known as “Map My Walk” is one of the best pedometer apps for Android. Map My Walk allows you to count your steps by tracking and monitoring your steps movement. It is a perfect companion for your better running experience. With the goe-based activities recording facility, it tracks and records your movements on Map. It also uploads data on its official website MapMyWalk.com where you may view your activities and detailed stats after logging in. MapMyWalk does not only keeps track of your route using GPS and steps count but also it measures the distance traveled. You may set running goals and based on your daily activities and recommendations, and it helps you achieve them by planning out your daily running routine. Apart from being one of the best step counter apps for Android, it has also loads of other important features like GPS tracking of the route, monitoring your workouts, calorie counting and helping you keep track of what you eat. It is all in one best pedometer apps for Android that you must give a try. 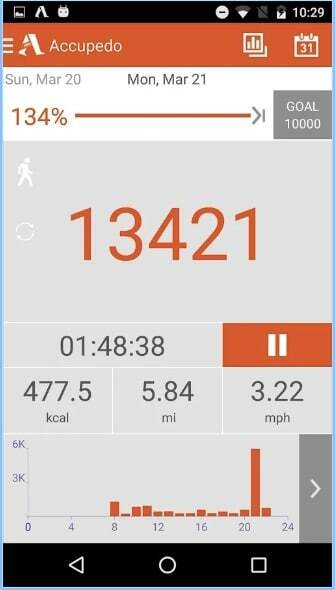 Moves is yet another free pedometer app for Android that automatically tracks your every step. It records any walking, running, cycling or other physical activities you do. Popularly known as “the activity diary for iPhone,” Moves has now reached to Android platform also as the developers of app ProtoGeo recently ported it to Google Play store also. After that, it has got a large number of installs within a short duration of time. It is very easy to use and has a very clean user interface. Moves app keeps track of the distance you traveled on the map, the number of steps that you take, the time is taken in covering that distance and also the calories you burnt for each activity. Thus, allowing you to view detailed stats and information making it a useful calorie counter app for Android also. Once started, the pedometer app remains ON forever, so you don’t need to take it from your pocket or bag and turn it on again and again. Although it consumes some battery, that is allowed considering utility it offers. Also Read: TRP Guides: How to Take Screenshots on Android Easily? Developed by the athletic app maker Runtastic, the Runtastic Pedometer Step Count is another useful pedometer app for Android that is known for the all-around facilities it provides for the ease of runners and sportspersons. The Runtastic Pedometer Step Count is a simple but useful pedometer app packed with loads of features. It is your personal tracker app for running, cycling, biking or other fitness activities. Runtastic keeps track of your running, walking, cycling, distance traveled, the route that was taken and time duration in covering that distance. You may keep track and view detailed stats of your fitness activities. Although some users recently questioned about its accuracy of data yet, the developers took it very seriously and fixed the bugs with recent updates. Accupedo Pedometer app for Android is an accurate pedometer app that monitors your daily walking, running or other fitness activities. It keeps track of your daily steps count, distance, calories, and route on the map also. It stores your daily fitness activities in the history log and provides an easier way to read data and charts. Accupedo Pedometer counts your steps accurately anywhere no matter wherever you keep your phone – in pockets, in purse or bag. 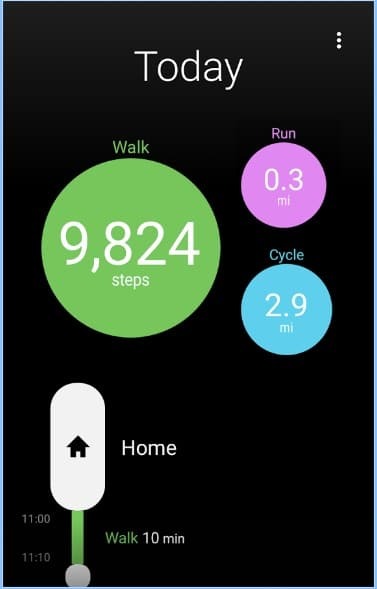 The important features of Accupedo Pedometer for Android includes an intelligent 3D motion recognition algorithm that counts your steps accurately by recognizing your walking pattern, the power saving mode that saves battery even when the app is running all day long, on-screen notifications and messaging. And also, the database backup of daily logs and charts to SD card or Google Drive, etc. The app also has a pro version that seems to be adding more features to Accupedo Pedometer, but unfortunately, I couldn’t find anything new. 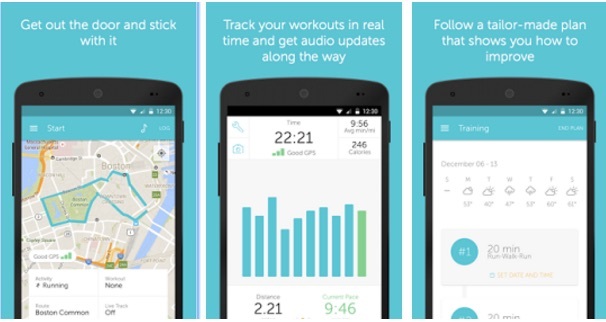 Fitbit is another free fitness app for Android that also works as an efficient Android pedometer app. 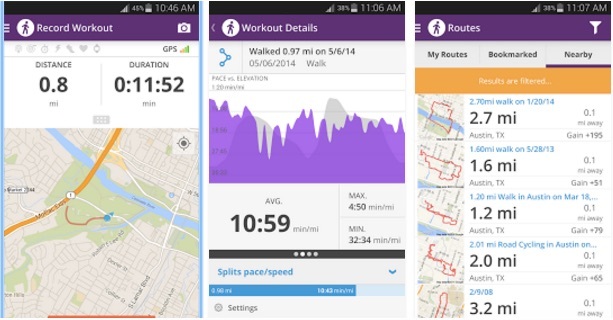 Fitbit tracks your running, walking, hiking using GPS. It keeps a log of your daily activities and provides a better way to manage your fitness at a smarter scale. You may set your daily, weekly or monthly goals for running, yoga, workouts or exercise and keep track of progress also. 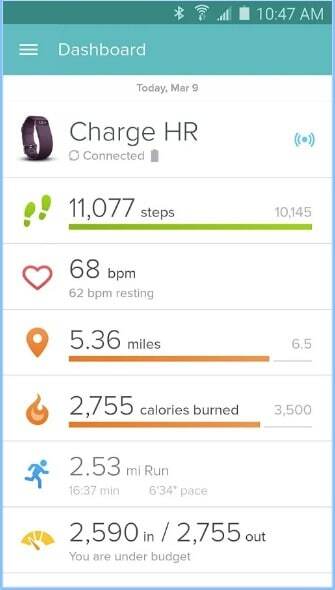 Fitbit also tracks your heart rate and the calories you burn every day. Fitbit is a well-designed, very easy to use Android step counter and pedometer app that works with Fitbit activity trackers. Starting with Fitbit fitness app for Android is easy as you only need to install Fitbit on your mobile device and connect it to Fitbit compatible devices. Once you connect to it, you get access to Fitbit dashboard where it automatically syncs all of your activities log wirelessly thus allowing you to set goals, view stats, analyze trends and share your achievements with friends. However, the only downside is Fitbit app for Android is compatible with a limited number of devices only. Although the number of devices is huge yet it’s something that an end user never likes. Noom Walk Pedometer is a pedometer app for Android that helps you achieve your health and fitness goals. It is an efficient step counter app for Android as it counts your steps actively every day, 24×7. 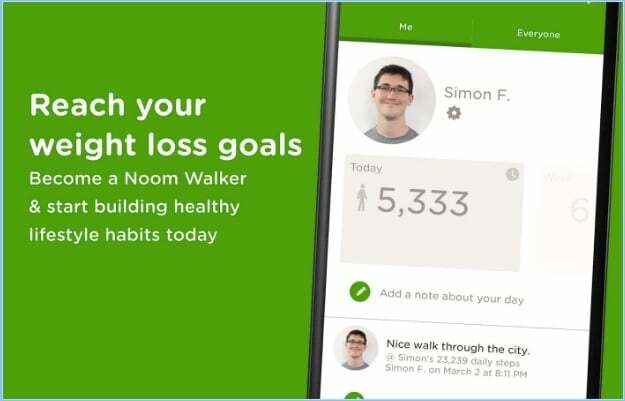 Folks at Noom Inc. believe in the idea that “Changing your body starts with changing your brain,” so they created Noom Walk Pedometer app for Android to help you challenge your brain to get healthy and achieve it with the help of sophisticated technology. Noom Walk Pedometer is a well-designed free Android pedometer app that seamlessly integrates with Noom Personal Coach’s dashboard where it automatically stores the data you submit. You may also choose for a course of 16 to 22 weeks, a long-term fitness program divided into three stages – Learning, Practicing and Mastery. Unlike other Android pedometer apps that keep running in the background and keep consuming battery, Noom Walk Pedometer claims itself to be power efficient. However, we recommend you to ensure it on your devices. Runkeeper is one of the best running apps for Android. It aims to help you improve your fitness by tracking your running, walking, cycling, bike rides and all other fitness activities using GPS of your Android phone. The Runkeeper step counter app also calculates the pace at which you are running or cycling, the distance of the route and the calories you are burning for any fitness activity. It frequently provides you with the audio update during your workout. Runkeeper is easy to use, simple Android pedometer apps that integrate with Polar Heart Rate Monitor, Pebble or Android Wear smartwatch as well as with a large number of fitness tracking apps. It also integrates with your phone’s music app to provide you better music listening experiences while running. You may set your fitness goals, track your progress as well as share your achievements with friends on Facebook, Twitter, Google+ and other social platforms. Having a fit body is very crucial for a healthy mind which ultimately leads to cheerful life. If you do lots of desk work or spend more time sitting inside your workplace, you need to be careful about your health. Having some physical activities on your “to-do list” improves your fitness as well as overall health. Walking is one of the best physical exercises that alone has the potential to help you stay fit as well as loose weight. However, you’ll often need a good pedometer app to count your steps, set your fitness goals, track your progress and many more purposes. With a large number of free pedometer apps available for Android, we have selected the best pedometer apps for Android devices. Let us know if we missed any. I” will look into the other pedometer apps, but I know Moves is definitely NOT a good app. Among other issues, it is the fact that any changes in the screen will reset your steps to 0 (zero) which is mighty inconvenient when you go on a 5 mile walk, and look at your phone to see 0 steps because the screen dimmed after 1/2 hour (the usual max for an android phone). In defence of Moves, I used it for a couple of years on my iPhone and it was brilliant, no glitches at all as described above. I’ve now got a Galaxy S6 which I prefer as a phone but Moves won’t work at all – gutted.